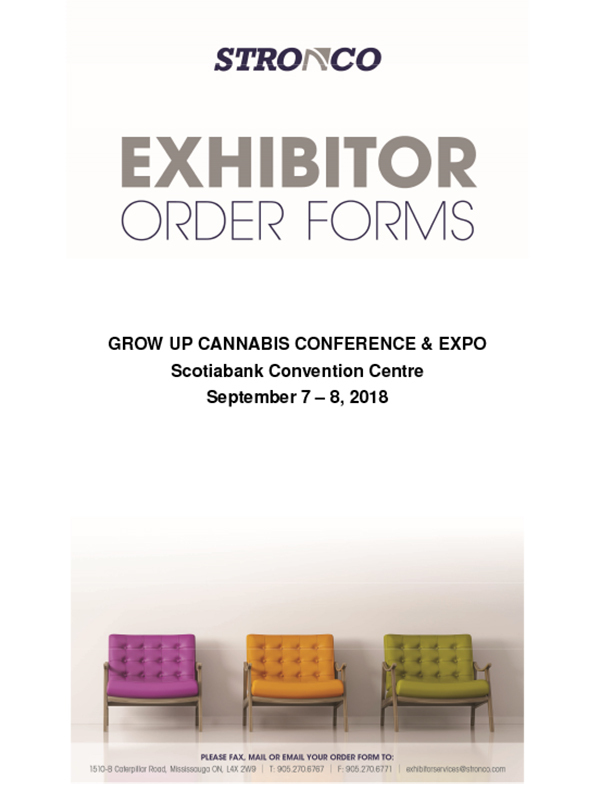 Please be advised that there is an email scam being circulated offering a Grow Up and Expo 2019 – Attendee List. Typically this will come from an email address such as @b2bshows-list.org, @attendees-list.org or a similar domain name. These are scams and are NOT related to Grow Up or its affiliates in any way. The use of our name has been made without our knowledge or authorization. These lists are inaccurate and have not been obtained from Grow Up Conference and Expo. We urge you to NOT RESPOND OR PURCHASE anything from them. Grow Up Conference and Expo respects the rights and privacy of our attendees and does not sell or provide our delegate or attendee list to anyone. Exhibitor lists are available on the Exhibitor List page, but we do not provide a delegate list to anyone other than our own applications. Arriving at the Buffalo Niagara International Airport? Advance rate deadline for electrical orders is Thursday, August 22, 2019. If you are coming from outside of Canada, A Letter of Recognition can be provided to print out and bring it with you when crossing the border. Each 10′ x 10′ booth comes with the basic side and black pipe and drape, a standard table and 2 chairs. All other extra furnishing such as carpets etc., can be order through Stronco. This gives you access to the exhibitor floor, food court and the Friday night networking cocktail. It does not include the conference. Includes access to conference panels and workshop as well as the exhibit hall, food court and the Friday night networking cocktail. Company listing in the official show guide. If you require more exhibitor or conference passes, they can be purchased at a 15% discount. Please call Grow Up at 1-866-GROW-UP-1 for a coupon. Cannabis and cannabis infused products are not allowed at the conference whatsoever. 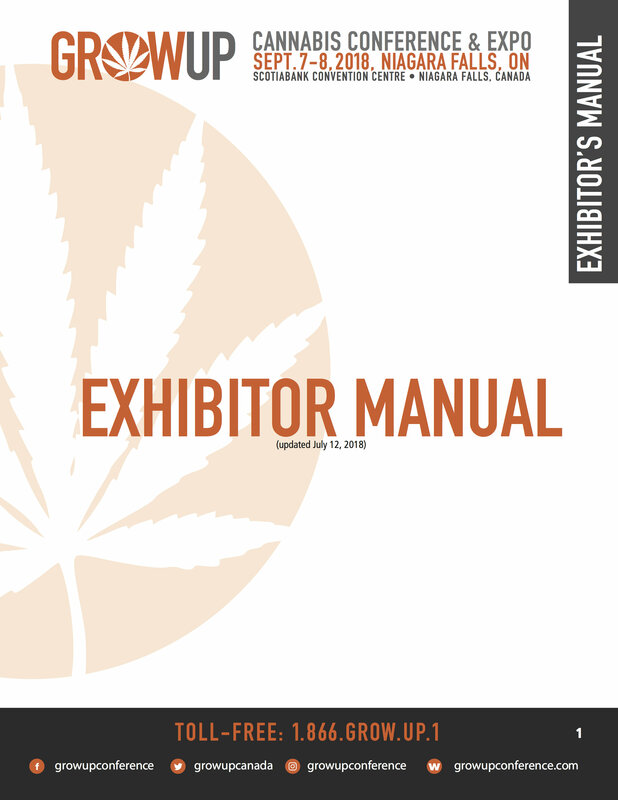 You can sell non-cannabis products at the show. Exhibitors will be loading in on Thursday, September 12th, starting at 9am. We will be loading based on set-up time. If you require more than 3 hours to set-up, please let inform Steve @ Exhibitor Service know right away 905.270.6767. The convention centre will not receive advanced shipment of goods. Advanced Shipments will not be accepted after August 30th, 2018. 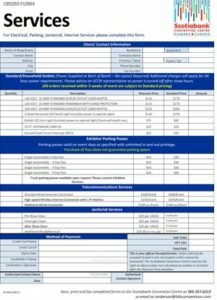 Parking passes valid on event days as specified with unlimited in and out privilege. Purchase of Pass does not guarantee parking space. Truck parking passes available upon request. Please contact Exhibitor Services. Exhibitors will be loading in on Thursday, Sept 12th, starting at 9am. We will be loading based on set-up time. All exhibits must be struck at that time and removed as soon as possible. No exhibits may be struck earlier than 5:00 pm without the authorization of the exhibition manager. Only when your exhibit is packed and ready for transport will your vehicle be permitted access to the loading dock. Grow Up will not accept any claim for loss due to fire, theft or damage of exhibits, nor will it be held liable for personal injury caused by an exhibit or exhibitor. All Exhibitors are required to pick up passes BEFORE load-in of their exhibits. This is extremely important for security reasons. No one will be admitted to the Exhibit Area without a pass. To complete registrations/make a change, please log into your Eventdex account that was created upon the purchase of your booth. To edit, select ‘My Tickets’ and then select the green pencil beside the individual ticket to add/make changes. NOT SURE IF YOU ARE REGISTERED YET? plus discounted parking charges of $10/vehicle/day for one vehicle per room. Reservations can be made online at https://www.radisson.com/growup or by calling 1-877-325-5784. When calling be sure to mention “Grow Up” to receive that rate. Telephone, Internet, A/V, Water and Electrical Services must be ordered through Scotiabank Convention Centre (SCCN). All order forms are on our website here.